Research has demonstrated that many applications can benefit from the Grid infrastructure. This benefit is somewhat weakened by the fact that writing Grid applications as well as porting existing ones to the Grid is a difficult and often tedious and error-prone task. Our approach intends to automatise the common tasks needed to start Grid applications, in order to allow an as large as possible user community to gain the full benefits from the Grid. This approach, combined with the adoption of high-level programming tools, can greatly simplify the task of writing and deploying Grid applications. 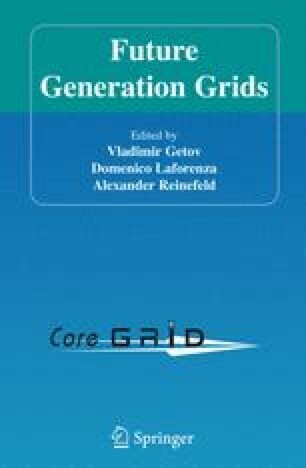 This work has been partially supported by the Italian MIUR FIRB Grid.it project, n. RBNE01KNFP, on High-performance Grid platforms and tools; the Italian MIUR Strategic Project L.449/97-1999, on Grid Computing: Enabling Technology for eScience; the Italian MIUR Strategic Project L.449/97-2000, on High-performance distributed enabling platforms; and by the EU FP6 Network of Excellence CoreGRID (Contract IST-2002-004265).